In the early 2000s, most people had never heard of almond milk and sales of the product were virtually non-existent. But as more people became aware of food allergies and intolerances and began seeking “plant-based” alternatives to traditional dairy products, sales took off. By 2016, the market for almond milk reached $1 billion. And its popularity continues to grow. Sales are expected to surpass $2.7 billion in the next four years. But despite surging popularity, commercial almond milk is not all it’s cracked up to be. Considering the amount of almonds in each carton, the product is rather expensive. And many brands contain questionable ingredients that could harm your health. So, let’s have a look at some of those ingredients – and why you might want to leave most commercial brands of almond milk on the shelf. Then, I’ll show you the easiest way to enjoy almond milk without the questionable ingredients and with greater nutritional value… all while keeping more money in your pocket! If you’ve read the back of an almond milk carton, you might have noticed a list of ingredients on the nutrition panel that aren’t “foods” – they are synthetic vitamins. The most common include Vitamin A Palmitate and Vitamin D2. Vitamin A Palmitate (Retinol Palmitate, Retinyl Palmitate): The FDA has classified this synthetic form of vitamin A as a “known human reproductive toxicant.” Animal studies show reproductive effects and tumor formation even at very low doses. Conversely, natural food sources of vitamin A (from animal foods like liver, egg yolks, and bone marrow) are well-absorbed and tolerated even in high doses. The “creamy” mouthfeel you might experience when drinking almond milk isn’t from the small amount of almonds contained in the product. Rather, it is the result of vegetable gums. Gums are a class of substances known as hydrocolloids. These compounds absorb up to 20 times their weight in water. They help to thicken liquids and provide a creamy mouthfeel. And while this might be good for the bottom line, it may not be so good for you. In addition, people with SIBO or IBS often experience digestive distress from consuming gums. If commercial almond milk doesn’t seem to “agree” with your belly – it is likely the result of gums added to the product. In a recent experiment with my beloved Instant Pot electronic pressure cooker (which turns out mouthwatering meals like Fork-Tender Whole Pressure Cooker Chicken and Melt-in-Your-Mouth Pot Roast in a fraction of the time of traditional methods), I discovered a very simple way to produce thick, creamy and highly-bioavailable almond milk – in just 20 minutes! The process is easy. The results are superior. And if you opt for conventional almonds, the cost will be about $1.50 per quart (25% less than store bought). If you use organic almonds, the cost will be about the same as what you would pay in the store. For what it’s worth, conventional almonds are just fine as almonds are a low-pesticide crop and the nuts are protected in the shell while on the tree. And these are not the only benefits, because the almond milk you make using the Instant Pot will provide more nutrients, fewer anti-nutrients… and you won’t have to be concerned with the added “ingredients” in commercial brands. But when you soak the nuts under pressure, you can achieve even better results in minutes. If you wish to add a bit of flavor or sweetness to your almond milk, you may also want to include organic vanilla extract, sea salt and a sweetener (like stevia extract). Close and lock the lid. Set the pressure to high and the time to 1 minute. When the time elapses, do a quick release or natural release. Pour the almonds into the strainer and rinse well. Add the pressure soaked almonds to a high-powered blender with 4 cups of water. Then squeeze well (with clean hands!) to extract all of the nut milk. Transfer to your lidded glass storage container and keep in the refrigerator for up to 4 days. For longer term storage, consider freezing in smaller containers or making “almond milk ice cubes” that are at the ready for your favorite smoothie or creamy recipe. A quick and delicious way to make almond milk at home! Add 1 cup almonds and 1 cup water to the Instant Pot. Close and lock the lid. Set pressure to HIGH and time to 1 minute. When time is up, do a quick or natural release. Strain almonds and rinse well under cold water. 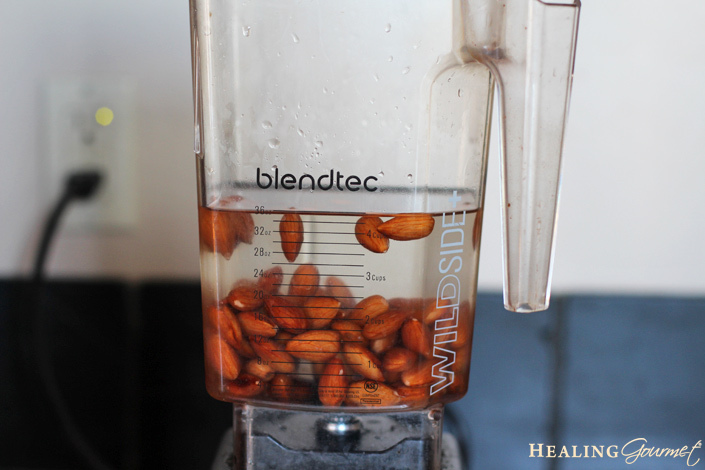 Transfer rinsed almonds to high-powered blender. Add 4 cups water. Blend on high for 2 minutes. Add optional ingredients and blend for 20 seconds. Set nut milk bag over large bowl. 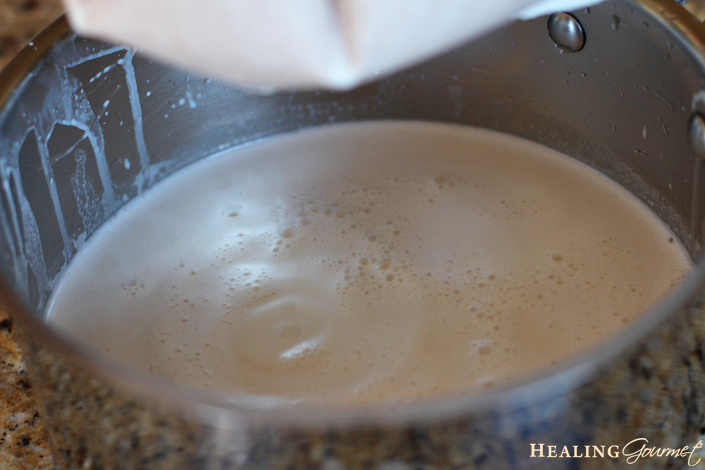 Pour almond milk through bag, squeezing to get all liquid extracted. Transfer to a quart-sized Mason jar and store in the refrigerator for up to 4 days. Thanks for posting this. Awesome. I don’t particularly care for Almond milk because it is so thin and watery. I prefer other nut milks since they are thicker and would love an instant pot recipe for other nut milks. Most almond milks are thin and watery because they are watered down. This almond milk is the creamiest I’ve ever had. You can follow the same recipe to make cashew milk too. Great info! Going to try it this weekend. I have issues with lectins, so have been avoiding almond milk. Would love to be able to use it again as it used to be a staple for me after I discovered my dairy allergy. Great to know about non-organic almonds being low pesticide, too…that should make a difference to the wallet! Thank you for posting this! I had NO idea my almond milk had so much junk in it. I seriously thought it was almonds and water. Btw, the Weston A. Price foundation is a psuedoscience group that disseminates a lot of false information, and anything you grab from them should be taken with a grain of salt or three. Anyway, great article — I need a nutmilk bag but I’m sure they can’t be too hard to find. Thanks again! You don’t care enough to read labels on the food you eat… but I’m supposed to take your advice on Weston A. Price? Ancestral nutrition is not pseudoscience. Dr. Price was a true pioneer whose work is finally getting some of the credit it deserves. More and more studies are emerging that validate his observations and his 40+ years of primary research. What’s more, every article on the Weston A. Price Foundation website is referenced extensively. As an investigator, I read reams of research, keep an open mind, and never rely on one source alone. And I encourage my reader to do the same. 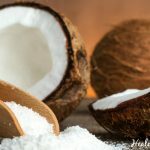 Great recipe but is there an Instant Pot recipe to make coconut milk? I have thyroid issues (hypo) and was told to stay away from almonds and almond milk. I’m telling ya, so much info on the internet, one doesn’t know who to believe anymore, but I’ve followed you for a while and do trust your judgement. Thanks for your question and kind comments. I too have thyroid issues, and am keenly aware of the impact anti-nutrients can have, especially for those of us who are sensitive. I’m betting the process of making coconut milk is pretty much the same. I might try 8 oz. shredded organic coconut (plain, unsweetened) with 8 cups of water. And I would try cooking for longer- maybe 10 minutes – before blending and straining. You’ve given me some inspiration to try my own. I will do some experimenting and see what I come up with. Please stay tuned 🙂 And I you give it a go, please let us know! I love oat milk and I am wondering if you have any suggestions to make that? Going to go try your almond milk now. I’ve been making my own almond milk for a couple of years now. Thank you for posting this article as I have been soaking my almonds for 12 to 24 hours first…a really inconvenient time factor. I have also been squeezing and popping off the almond skins after soaking because I understand the skins can cause digestive distress that irritate my colitis. Do you think I should still continue to do that before blending or will pressure cooking neutralize the lectins enough that I can also eliminate that step? I have been following Dr. Gundry’s Plant Pardox program and I know that he recommends pressure cooking foods that have lectins once you have been on the program long enough to have healing results and can introduce lectin foods occasionally if they are pressure cooked. He also only recommends blanched (skinless) almonds. Thank you always for your wonderful articles, recipes and research! Thanks for your kind comments and question. Regarding the almond skins – it really depends on how sensitive you are and where you are in your healing. Thanks for your quick response! I am thrilled to say that I am feeling so much better after completely changing my diet as well as making a real effort to “clean up my act” by eliminating toxins in cleaning products, health and beauty products and even limiting my exposure to EMFs. And I have to say that your articles and recipes were my first sources of information that changed my health and ultimately, my life! You switched on a light bulb that started me on a path to heal myself of my colitis symptoms as well as the anxiety, depression and sleepless nights that were all related. 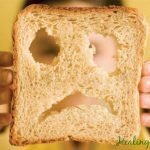 I eliminated gluten because of reading your articles, even though I don’t have Celiac disease. I had a terrible sweet tooth and was a complete junk food junky. But I gave up almost all sugar and junk food even though I’m not overweight and never heard of sugar causing inflammation until I read your articles. I started buying organic foods and pastured meats because I even started cooking and baking to avoid additives and preservatives in processed foods using your wonderful recipes. Since then I have been reading many sources from doctors and other researchers that also agree with your research. I think I had a leaky gut caused by too many meds and inflammatory foods that caused my colitis. But now I am no longer on steroids, over the counter meds, anti-depressants and anti-anxiety meds. Instead I’m taking curcumin, l-glutamine, collegen, mct oil, bone broth and lots of healing herbs, foods and healthy fats. The best part is that I don’t have cravings or miss the inflammatory foods that were making me sick. I just feel great! Thank you for sharing your knowledge and creating such yummy recipes and baking products. You started me on a health quest that I will always be grateful for! PS I think I will continue to skin the almonds because I’d hate to mess with a good thing. Your note brought tears to my eyes. I am elated that you have found your way back to health and I am so grateful to have had a small part in your healing journey. It’s for people like you – who have the courage to learn and the will to change – that I do what I do. Our collective health is in serious jeopardy and changing the epidemic of chronic disease begins with the food on our plate. Thank you for setting the example for others who are suffering and giving them hope that health and happiness can be regained naturally. Thanks for the recipe! What is the nutritional information per batch? I see there’s a heading for it, but not the information. I can’t wait to try this recipe! I’ve never tried making nut milks, but have wanted to do so! A question, can the almond pulp be used for anything, or is it just tossed out? Thanks! Many people use the pulp for muffins. Can I use the remaining pulp for almond flour/meal? Hi Amy, I just answered that question for Jen. Quick question: the water added to the blender is just regular water right? That’s right – just good old H20! Can I double this and just double everything else? This is pasteurizing the nuts tho’ ….your thoughts? Pasteurize: to expose (a food, as milk, cheese, yogurt, beer, or wine) to an elevated temperature for a period of time sufficient to destroy certain microorganisms. But we are not doing this to pasteurize, we are doing it to liberate nutrients, reduce anti-nutrients and make a delicious, creamy almond milk without additives. Hi! Can I double this and if so do I add two cups of water to the instant pot? And double the 5 cups of water to 10? Thanks! For the initial steaming, yes, I’d add 2 cups water with 2 cups almonds. Then you would drain that and proceed, increasing the amount of the ingredients proportionally. Awesome! Worked out perfectly! Thank you! Super! You are most welcome, Ana! Thanks for visiting Healing Gourmet. I’ve been making my own almond milk for a little while, using the soaking method. Today will be my first try with the Instant Pot. When I couldn’t find a nut bag locally, an employee at a nearby hardware store known for it’s wide selection of canning supplies suggested trying a bag made for straining homemade jelly. It works beautifully, and rinses clean as new. From the pictures of nut bags I’ve seen, they seem very similar. It came in a two-pack, and was very cost effective. Wish me luck, as I’m very new to the Instant Pot. I hope you LOVE this recipe – it’s super simple and no luck is required 🙂 WAY easier than traditional soaking with much creamier results.